Celebrities are famous for going in to rehab to escape from the media while they plan a relaunch of their careers. Amongst other things, they may be addicted to publicity. The performer may need the attention of an audience to bring them to life and become lost and depleted when the show is over. Rehab may give a brief respite and might help them muddle along a bit better. With luck they might discover some new interest, find a way of coping that helps them survive the fray when they return to their social circuit and the celebrity arena. But with so many celebrities flocking into rehab and revealing their experiences to the media it becomes just another platform for their publicity addiction. Of course celebrities do not go into rehab to get cured of a publicity addiction, just to offset negative consequences, the other addictions that result from it. 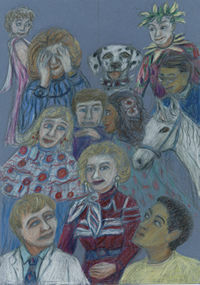 Some Art Asylum characters complain about the celebrity cult and the association with rehab. But they do not want to see Art Asylum taken over and rebranded as a Wellbeing Consultancy Forum . Art Asylum does have its own problems and dramas with personality clashes. We have some delightful characters here who enjoy a joke and like to tease their comrades, especially those in the Socialistic Intelligentsia Party. Unfortunately we have one or two characters who cause nothing but trouble and whom we would like to see disappear. Were it not for these individuals Art Asylum might indeed be the cultural retreat of our dreams. In Art Asylum we face two challenges: bullying and social phobia. How can we protect shy stars?